Metal maniacs, rejoice! I am proud to present to you: THE CYBERIAM; signed via Melodic Rock Records, hailing from the United States of America - performing Progressive Rock/Metal, on their debut self-titled album entitled: “The Cyberiam” (released February 21st, 2018). 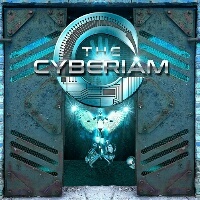 THE CYBERIAM arrange an intricately designed development of heavy-hitting Prog Rock/Metal distinctions, 10 tracks ranging at around 80 minutes - “The Cyberiam” contructs a solid slab of progressively technical songwriting adroitness in which is suprisingly captivating. Starting off with “Alice In Afrerland”; the quintet in question formulate a diversely dynamic formula of uniquely composed rhythmic melodies and harmonic efficaciousness, the melodious contrast consistently flourishes with remarkably detailed results in which deliver a concrete experience – the quartet are distinguished with unprecedented equalities, excelling with easy-listening yet still providing a creative balance of bouncy crunchiness. “Cool Kids” showcases the complex dexterity of Keith Semple’s vocalization and guitar skill; consisting of clean to high-pitched efficiencies, and proficiently executed riffs and solos which has an enlightening effectiveness in the conceptual design. “The Fall” demonstrates Frank Lucas’ keyboardist attributions which supply an atmospheric ambience that conveys the profusely robust inventiveness of the band - “Don’t Blink” is no exception in this, as it dominates with chugging yet galloping salubriousness while brilliantly amalgamated with the aforementioned characteristics on display. Tommy Murray on drums pummels away with battering cymbals and hammering savageness, portraying diligent expertise with full force. “2020 Visionary” has a grandiose manifestation of organic aesthetics and fluid substances which distributes Brian Kovacs bass guitar/vocal quirkiness, with impressively audible flamboyant vibrancy. The band relentlessly establish rapidly swift catchiness and stylishly groovy memorability, juxtaposed with the abstract elements in the song “The Historian” - implementing mesmerizing energy and enlightening yet fulfilling craftsmanship. “My Occupation” manages to keep things afloat with acoustic and pianist variance, admirably embellished with commendable comprehension and the occasional battle hardened hymns that have a raw yet chaotic amalgam built in. “Juxtaposed” relishes on systematic coordination of appealing tempos and rhythmic persistence, still contrasting with blistering mayhem for good measure. “Brian In A Vat” excels with psychedelic enticements, which assorts with enjoyably constructive executions. Overall concluding with the epic “Nostalgia”, I certainly experienced something special here. Bottom line, if you are looking for something unparalleled and magnificently rewarding - THE CYBERIAM will offer a worthwhile discovery that is most definitely worth your time and money, check it out.